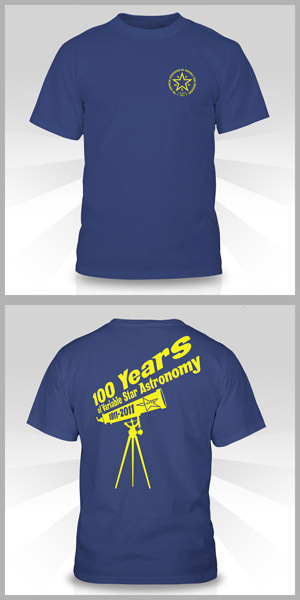 These quality tees have the AAVSO logo above the front left breast, and artwork with the slogan '100 Years of Variable Star Astronomy' on the back (right). Arne will autograph each shirt in permanent ink at the location and with the message you request. They are made of 100% cotton and produced by American Apparel, meaning all textiles are made in the United States (not just the screen printing). The goal is to raise $10,000.00 to help pay for the meetings, banquets, banners, plaques and other expenses associated with our 2011 Centennial Celebration. You may purchase as many T-shirts as you wish. Once we have sold 200 we will have reached our goal of $10,000.00 and will stop selling them. You can order these collector edition T-shirts from our online store. You can also simply make a donation to the centennial fundraiser online at http://www.aavso.org/make-gift by designating your donation to the Centennial Celebration Fund.